Contact Blue Door Electrolysis for a FREE consultation that includes 15 minutes of electrolysis on the area of your choice. Location and Directions. Be warned Richmond Police are quite strict with speed limits especially the 25 zones. 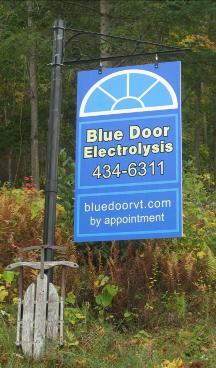 Blue Door Electrolysis is conveniently located along the I-89 corridor, midway between Burlington and Montpelier, and is less then a 30 minute drive from either. From Burlington Area: Take I-89 South and exit at Exit 11; turn RIGHT at the end of the off ramp. You are now on Route 2 headed east. You will pass a Mobil Station on your left. 3.5 miles past the traffic light in Richmond you will pass Harbor Vintage motors Watch the RIGHT for a Bridge & Cochran Road. Turn RIGHT onto the Bridge & Cochran Road. Once on Wes White Hill, our drive is the 5th drive on the left #401. Watch left for the sign; “Blue Door Electrolysis”. If you reach the top of the hill and/or the road turns to dirt you’ve gone too far. If you get lost call for help 434-6311. Take I-89 North and exit at Exit 10; at the end on the off-ramp turn LEFT onto Route 100. You will only be on Route 100 for about a half mile; Route 100 intersects with Route 2; turn RIGHT at the round-about onto Route 2; you are now headed West on Route 2 toward Richmond and proceed on Route 2 for 9 miles. At the 9 mile mark, watch the left for Cochran Road at the bridge and TURN onto the bridge, go slow, 25mph zone. Take the second paved left after the bridge onto Wes White Hill which is just before a smaller concrete bridge. (If you go over the second smaller concrete bridge you’ve gone too far). Our drive is the 5th drive on the left #401. Watch left for the sign; “Blue Door Electrolysis”.